Every 24 hours the NHS sees more than 1 million patients, therefore walls, corners and doors in healthcare buildings can quickly deteriorate. Gradus wall protection profiles have been designed to protect surfaces such as walls, corners and doors and provide an essential barrier against damage caused by the general flow of wheeled and pedestrian traffic. We have worked with Healthcare Estate Managers for many years and understand the importance of supplying solutions that save money and extend the lifecycle of the building, which ultimately reduce ongoing maintenance costs. Busy healthcare corridors are prone to damage due to the high levels of footfall and impact from wheeled traffic, such as beds, wheelchairs and cleaning carts. This leads to a time-consuming, laborious and a costly cycle of repairing and painting. SureProtect Endure - PVC-u wall cladding that can be used in sheet form for total wall coverage, or can be cut into rubrails or kickplates, or into bespoke designs. SureProtect Endure can also be thermoformed to produce bespoke profiles such as corner guards, column guards or door edge and door frame protectors. It's through-coloured and textured to minimise the appearance of scuffs and scrapes, while providing a second protective skin to the underlying wall. Corner Guards – High-Impact help to protect vulnerable corners from trolleys, beds and wheelchairs. They are designed to absorb impact and are modular in design for ease of replacement, protecting future budgets. Wall Guards – when installed at the correct height, they form a robust defense to pedestrian and wheeled traffic impact. They are also modular in design - the covers and accessories are replaceable - helping keep corridors looking good for longer. Bed head protectors are specialist profiles, specifically designed to protect medical equipment found in and around patient beds. Their angled design is ideal for keeping beds and other moveable objects away from the wall. Extender options are also available to provide increased projection, keeping medical eupiment and trunking protected. 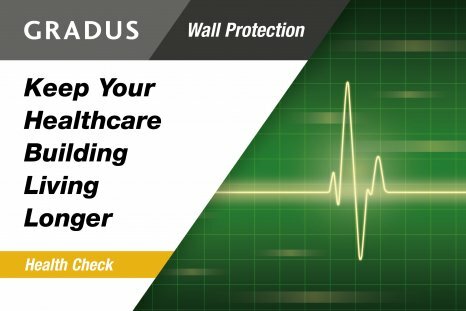 Walls in healthcare environments have unique considerations. Clinical environments demand a hygienic solution such as wall cladding. Our SureProtect Pure hygienic wall cladding offers a smooth and easy to clean surface that forms an impermeable barrier to moisture and bacteria, as well as being robust enough to be resistant to impact damage. It is important to consider handrails throughout. Handrails in healthcare buildings often serve more than one purpose, such as support and respite to patients, protection to the walls and wayfinding. Handrails need to be easily identified so tonal contrast must be considered. Integrating artwork onto walls in healthcare buildings can help to make the environment more relaxing, as well as offering a welcome distraction from illness, which can in turn aid recovery. It is now widely accepted that any new build or refurbishment healthcare project should have a dedicated ‘arts budget’. SureProtect Design® wall cladding is the perfect solution for incorporating bespoke design solutions into your healthcare environment. Your picture or artwork is printed onto the back of a clear textured sheet which offers you an easy to clean robust solution. A heavy-duty, robust solution, is required for service areas and loading bays as they are often at risk from extensive damage caused by wheeled and vehicular traffic. We offer aluminium chequer plate wall cladding as the embossed chequer pattern conceals the effects of any surface damage caused by wheeled traffic. Combined with our rubber wall and corner guards we can offer a complete wall protection system. Gradus is the largest UK manufacturer of Wall Protection profiles and has over 20 years healthcare experience. Our products are installed on many prestigious projects where we have built an unrivalled reputation for quality, service and installation. The Gradus Contracts service has provided peace of mind for contractors and clients throughout the design, tender and delivery stages of numerous projects. A dedicated project team will support you from initial enquiry and specification, through to site survey and installation. We believe that protecting budgets is as important as protecting walls, and that’s why we offer our unique FREE Building Survey service. Our specialist Wall Protection team will use their product expertise to identify the most vulnerable areas within your building and recommended protection where it’s needed.